"Arafel": "Tea in the Sahara?" Quote; ""Better known as a composer* than a writer, he has not allowed his passion for either form of expression to interfere with his growth into completeness of personality. Now this book has come at the meridian of the man and artist. 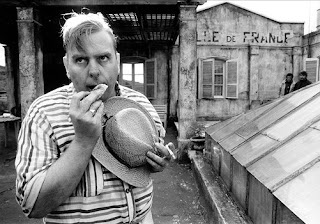 And, to me very thrillingly, it brings the reader into sudden, startling communion with a talent of true maturity and sophistication of a sort that I had begun to fear was to be found nowadays only among the insurgent novelists of France, such as Jean Genet and Albert Camus and Jean-Paul Sartre. 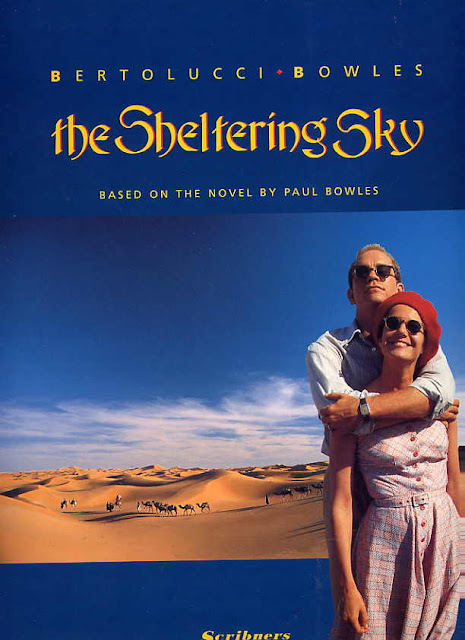 With the hesitant exception of one or two war books by returned soldiers, "The Sheltering Sky" alone of the books that I have recently read by American authors appears to bear the spiritual imprint of recent history in the western world. Here the imprint is not visible upon the surface of the novel. It exists far more significantly in a certain philosophical aura that envelopes it"..
..""The Sheltering Sky" is the chronicle of such a journey. Were it not for the fact that the chief male character, Port Moresby, succumbs to an epidemic fever during the course of the story, it would not be hard to identify him with Mr. Bowles himself. Like Mr. Bowles, he is a member of the New York intelligentsia who became weary of being such a member and set out to escape it in remote places. Escape it he certainly does. He escapes practically all the appurtenances of civilized modern life. Balanced between fascination and dread, he goes deeper and deeper into this dreamlike "awayness." From then on the story is focused upon the continuing and continually more astonishing adventures of his wife, Kit, who wanders on like a body in which the rational mechanism is gradually upset and destroyed. The liberation is too intense, too extreme, for a nature conditioned by and for a state of civilized confinement. Her primitive nature, divested one by one of its artificial reserves and diffidences, eventually overwhelms her, and the end of this novel is as wildly beautiful and terrifying as the whole panorama that its protagonists have crossed. The Sahara, the great desert (in fact, the third largest in the world, after Antarctica and the Arctic) whose surface reaches almost the nine and a half million kilometers, spanned several countries on the African continent, located to the North of it. As you might expect, in this vast territory, there are several cultures and customs, but all have something in common: tea and their ceremony. A real ritual. This ritual called it “attay attalata yimat” which means, literally, “the three and tea”. There is a person that is the responsible of making this ritual and you called “to the-quiam”. In addition to prepare thoroughly the tea, should have a good capacity of speaking, have good appearance and good education. It is a great honour for him perform this ceremony. Which are around, witnessing the preparation of the tea, not doubt in making clarifications or reviews if it considered necessary. When complete the ritual, if everyone is satisfied with how to prepare it, they pull their empty glasses in the direction of “to el-quiam” as a sign of gratitude. The tea served at the afternoon called “dahmis” and according to the locals, is ideal for removing the headache. According to the Saharan tradition there are to be three teas: the first is bitter as life, the second sweet as love and the soft third as death*. After mentioning some curiosities and traditions of the ceremony of the tea, then explain the mode of preparation. They throw water in the teapot of metal that called him “berred” and put it to boil in hot coals of charcoal. With the hot water they miss half a cup of tea in the tea leaves and have it boiling for a good time. The first portion will be dismissed for being very bitter. Again, they will be pouring water and this time with lots of sugar. Once cooked, you pour in a few small vessels called “Kisan”. It is important that the “el-quiam” to throw beverage from a height to achieve desired foam and that is so characteristic of the Sahrawi tea. Such is the importance that the Berbers overlook tea that, on many occasions, paid large amounts of money or ran many kilometers to get a kilo of tea and thus be able to celebrate this traditional ceremony. In general, they used imported Chinese green tea. From Aromas of tea and if you want a tea Saharan-style, in addition to carrying out the mentioned way of preparation, would recommend using green tea china Gunpowder. This variety is one of the highest-quality green tea and is very appreciated in Morocco. In addition to the curiosities of the ceremony, it should be noted that tea Sahrawi style provides numerous health benefits, such as facilitating digestion. Also, the made of take it very hot and in full desert, allows that the body is acclimated best to the temperatures high of the foreign. This makes that the body does not make an effort extra and, therefore, performs an energy saving. In addition, it helps blood flow and sweating, so it cools the body. The tents, the camel and the tea are three names that are associated to the Sahara. The ceremony of prepare, serve and enjoy this drink is without doubt, a ritual widely respected and admired by the Saharans and by visitors who are lucky to enjoy it.